I’m a little late to the chia seed pudding bandwagon, I know. But that doesn’t mean I can’t be an enthusiast. 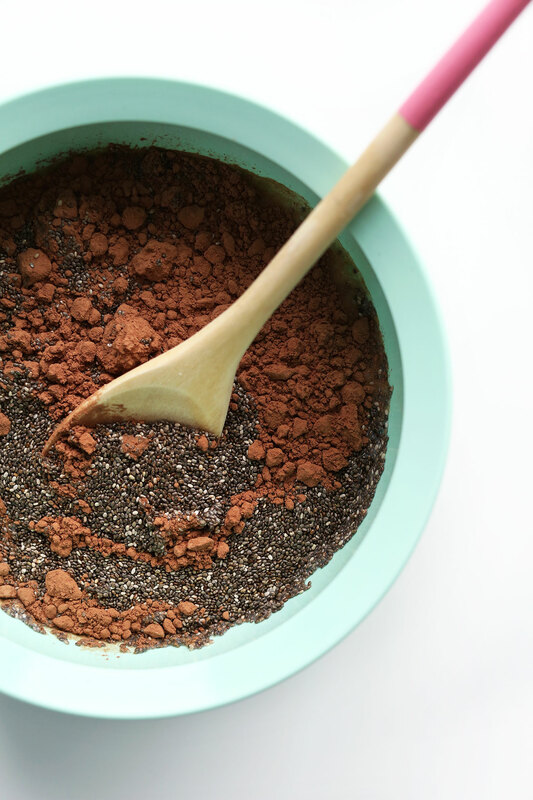 The chia seed has been having a moment for what seems like the past five years. That’s probably because its uses are limitless. My favorite everyday way to use chia seeds is in place of flax seeds in a Flax Egg, Simple Fruit Compote, and Grain-Free Granola. But upon discovering you could also use them to make creamy, dreamy pudding, I had to give it a go. Consider this recipe my whittled down, super simple version that’s naturally sweetened, vegan and gluten free. Anyone can make it! Plus, it’s so healthy it’s actually suitable for breakfast. If that doesn’t sell you, I don’t know what will (Rhonda). Let’s get our pudding on, shall we? This recipe is simple, requiring just 6 basic ingredients that are totally versatile. This is the beauty of chia pudding. Once you have the chia seed-to-liquid ratio right, the flavor possibilities are endless. Make this the night before for a decadent breakfast or mid-day snack. Or prep it in the morning for a hands-off, simple dessert to unwind from the day. You can’t go wrong either way! And it lasts for a couple of days in the fridge – if you can resist sneaking spoonfuls that long. If you try this recipe, let us know! Take a picture and tag it #minimalistbaker on Instagram so we can see. We also love seeing your comments and ratings. It’s the ultimate internet ego boost. Cheers and happy pudding making! *Note: Recipe updated 12/5/2018 for improved texture. 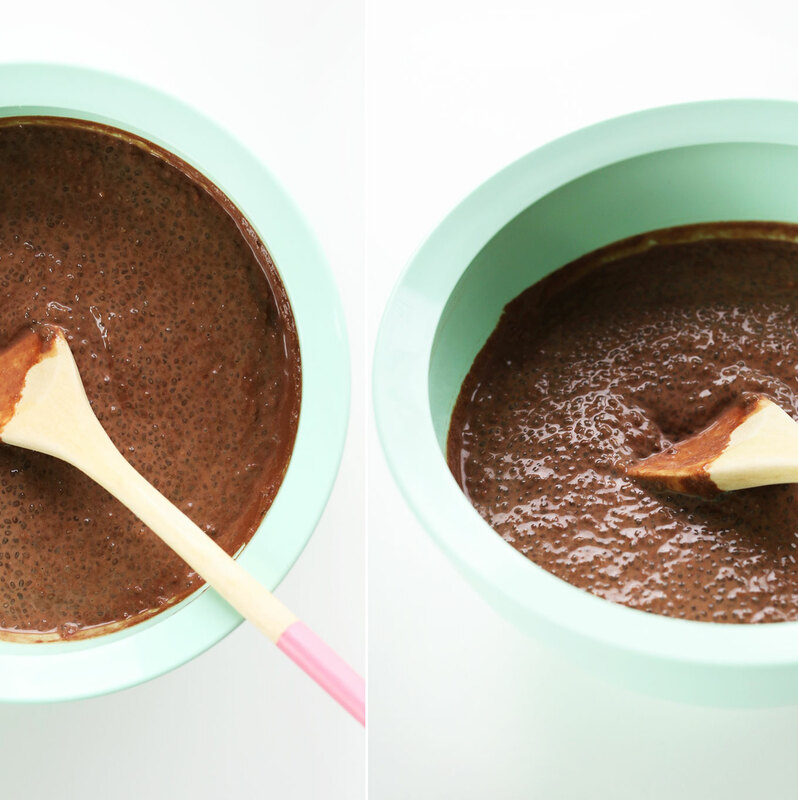 Simple, 6-ingredient chocolate chia seed pudding that's naturally sweetened and so thick and creamy. Loaded with nutrients and perfect for breakfast, a snack, or dessert! To a small mixing bowl add cacao powder (sift first to reduce clumps), maple syrup, ground cinnamon, salt, and vanilla and whisk to combine. Then add a little dairy-free milk at a time and whisk until a paste forms. Then add remaining dairy-free milk and whisk until smooth. Add chia seeds and whisk once more to combine. Then cover and refrigerate overnight, or at least 3-5 hours (until it's achieved a pudding-like consistency). Leftovers keep covered in the fridge for 4-5 days, though best when fresh. Serve chilled with desired toppings, such as fruit, granola, or coconut whipped cream. *Nutrition information is a rough estimate calculated without optional ingredients or toppings, and with almond milk (not coconut milk). *Prep time reflects chilling for the least amount of time (3 hours). *Recipe loosely adapted from Pop Sugar. This was my first time trying chia seed pudding and it was fabulous. I’ve always been hesitant bc I normally dont eat pudding and have a thing with textures sometimes. But this was sooo good!! I cant have nuts so i used oat milk. Added coconut milk whip and strawberries. Amazing! I love chocolate and crave a sweet snack at night, this is my new Go-To! I made a half batch at first to try it and was so disappointed in myself for not making the whole batch! I think it’s a little rich with without the coconut whip or just plain coconut cream at least. I also whisk or stir once it’s been in the fridge a couple hours. It has a better texture than just stirring after its ready. I loved it! If in the mood for chocolate and not feel guilty, this is for you. I didn’t quite have enough Chia seeds but made it anyway, turned out a bit runny. Bought more to make it again with the right amount of seeds and should be much thicker. The taste is good but the consistency is really too sticky for me, and it does not blend at all. The previous recipe was in my opinion perfect! Could you please share it again- the blended version? Hi! You can blend it all together in a blender as opposed to a mixing bowl before chilling for smoother texture. Hope that helps! I have had such a hard time giving up sweets like candy bars . Best chocolate chia pudding recipe I have found. I use 3 tbsps maple syrup as I don’t like too much sweetness. I’m 66 – just goes to show you can teach an old bird new tricks! Love trying new things and this recipe hits the spot. So glad to hear it, Susan! Thanks for sharing! I followed the recipe, except that I used unsweetened cashew milk. (Sweetened with 5 Tbsp maple syrup). I whisked all ingredients together except the chia seeds, then slowly whisked the seeds into the mixture. The seeds were evenly distributed throughout. I refrigerated the pudding for about an hour, then whisked it again before chilling overnight. It was actually ready to eat within about 4-5 hours. I will definitely make this again. Easy & very good. This is the best chocolate chia recipe I have made. When I make chia pudding I was told to combine the seeds and the liquid. In this recipe I should have followed the directions because the cocoa powder took a bit longer to incorporate into the liquid and chia seeds. Otherwise it was great! Thank you!! I found this very simple to make, and loved the texture, and the taste. Try it, you’ll like it!! Recipe looks lovely I will definitely try it.. can I use honey(in the same quantity?) instead of maple syrup? and is there a recipe for homemade almond milk? That should work! Here‘s our recipe for homemade almond milk. Hope that helps! To all the people complaining about the texture and the mixture ending up half-slimy/half-liquid, try blending the chia seeds alone before adding them to the liquids and then blending again briefly after adding them to the liquids. This will help distribute them evenly so they don’t all settle at the bottom and gel into a ball. This recipe looks delicious! Thanks for the suggestion, Ree! I needed an easy way to add more fiber to my diet, so I tried this. At first I found the texture difficult to deal with by itself, but the next day I added 1/4 cup whole raw almonds and sliced up a whole banana for each serving, and that did the trick! I eat this for breakfast almosy every morning, and I love it! All the teachers at school have asked for the recipe! Great flavor. I prefer 2 cups of coconut milk if you’re using that instead of the almond milk because of the already thicker nature coconut milk has. I made this. It has a good flavor, but the texture is slimy. I was looking for a chocolate-y, easy, healthy recipe. I rarely like how online recipes turn out, but this one actually delivered. I did add some mini vegan dark chocolate chips just because, but I would eat this pudding with or without the chips in the future. So good! I must have missed that part. :) Five stars. Delicious. I brought some to work today to satisfy my sweet tooth. I made this, and both my daughter and I LOVED it. It was delicious and very filling. I just made it for the second time, and I added cardamom this time. Hi. My son is allergic to tree nuts, could I use regular milk, we buy 1% ? Thank you! Oh my! Sooo good! My first taste of chia seed anything. Broke recipe down to one serving, sorry I did. Will definitely be on my dessert list from now on. Thank you. I love tapioca, if you don’t like tapioca’s texture, you may not like this, delicious as this yummy recipe is. I made this last night. I followed the recipe but it turned out nasty. When I got it out this morning, the top half was all liquid and the bottom half was like gelatin. I had to mix it for a while. I put it back in the fridge for a few hours and just now tried it. It’s not sweet, very bland and the taste of the chia is super bitter. It was not smooth and the seeds had this soft but firm texture. I threw it away. Hi Jamie, sorry to hear this didn’t work out for you! Is it possible that you missed an ingredient? Leaving out the maple syrup would cause it to be both bland and not mix well. Hope that helps! Mine also came out the same way :( liquid on top and chia all gelatinous on the bottom. It was very unpleasant to eat even after I tried to mix it up. I kept getting balls of slimey chia. 😞😞 I must have done something wrong, but I followed all the ingredients and steps! The one thing I was thinking is the container. I stored it overnight in a mason jar, and now I’m wondering if I need a wider, shallower container so the chia doesn’t just sink to the bottom. I’m not giving up!! Thoughts? That could definitely be the case! Another idea is to stir/whisk it again once it has been in the refrigerator for 30-45 minutes. Hope that helps! Re: mason jar, that’s what I made mine in, and it came out great. After I put the lid on, I did shake the jar really hard for a couple of minutes (made it around 8pm), and then shook it again around 10pm when I was heading to bed. In the morning, it was fantastic. Made this and it is delicious! Hi Michele, here’s our guide on How to Make Coconut Whipped Cream. Hope that helps! Sorry but I would not waste my time making this. It tasted horrible. I was gagging when I put it in my mouth and had to spit it out. So sorry the chia pudding didn’t work out for you! Did you make any modifications? Is it possible that you left out the maple syrup? Have you tried this with Oat Milk? Do you think anything would need to be adjusted or just sub oat milk for almond? Hi Brittania, we haven’t tried it with oat milk, but think you could sub it 1-for-1. If you give it a try, we would love to hear how it goes! I used oat milk, same amount as called for in the recipe and it worked well. Delicious recipe! I can not wait to make this! Used to make chia pudding often and stopped… don’t know why. Anyways, my question is how much stevia would I use instead of maple syrup? Thanks!! Another reader used half a teaspoon of Stevia per portion and found that it worked, but we haven’t tried it ourselves! I added a little cayenne pepper and served it with raspberries and coconut on top… so good!!!! I made this and it was delightful – so delightful that I ate all of it??? How can this be 4 servings!!! ???? We’re so glad you enjoyed it, Amy! We specify it as four 1/2 cup servings (just a snack) but feel free to double or triple the recipe in the future! People, people!!! I’m getting ready to make this….judt popped on to make sure I wrote it all down right, and decided to read comments. Just about everyone who said it was too salty, and that was over 80% of the reviews, needs to learn what a PINCH of salt is! I made this with sugar free syrup and it turned out great! Less calories and nice and filling. I used a heaping half teaspoon of cinnamon and roughly 1/16 tsp of salt. Not too salty or sweet. Served with a dollop of cool whip. Great for an evening treat without destroying my blood sugar. Also made a batch with half lite coconut milk from the can and half unsweetened almond milk and it was noticeably creamier. Great recipe! I have a question about he calories count on this. By my calculations the chia seeds alone attribute 600 calories to this. That is 150 calories per serving alone from them. Where I should the 133 coming from? Hi Pam! We use caloriecount.com for our nutritional information on the site. But even their site states 69 calories per tablespoon. This recipe has 8 tablespoons. 552 calories for chia alone = 138 calories not including anything else. Wow, that question got butchered on my phone. Teaches me to not look it over before pressing send! Basically everything I have read chia seeds have 130-150 calories per 2 T, 1/2 cup = 4 tablespoons. Essentially each serving (4) has 2 tablespoons of chia seeds, which would be 130-150 calories. can this recipe use lactose free milk instead of almond milk? Made this last night. Delish! But for my liquid, I used one cup of whole milk and half a cup of water. I didn’t think it was too salty as some others have said. I would make this again. Thanks for the recipe! I followed recipe exactly except used nonfat dairy milk, blended after soaking overnight, was still bit crunchier than I prefer as I’m weird about textures, so I topped with my favorite homemade cherry granola! The crunchy granola disguised the crunchy texture of the pudding and I and my 2 year old absolutely devoured it for breakfast. Rich and wonderful! THANKS SO MUCH FOR THE RECIPE! Have read many reviews and feel overwhelmed about what to try first for a creamier texture…the only way I see hooking my 4 and 7 year old, and husband! They are REALLY picky! HELP! This would be such a easy, healthy breakfast for our whole family! If only I could get a more creamy texture. I made this pudding and I loved it!!! I will adopt this recipe as a regular breakfast or snack recipe. I did not use any salt because I read the comments before. I used coconut milk instead and I did not add any maple syrup, I added two teaspoons of stevia to cut the sugar content. I was delicious!!!!! Yummmmm! Took advice from comments to mix the cocoa with a bit of soy milk first, then add chia seeds, then the rest of the milk, vanilla, a pinch of salt and finally syrup. I used honey. It turned out to be a deliciously addictive and yummy chocolate pudding. Smart! Thanks for sharing, Micha! Whoop! We are glad you enjoyed it, Frida! I just made this recipe, I was doubtful at first but after the first taste I was sold! It took no time at all and was super easy. It satisfied that sweet craving without the guilt. I didn’t change anything, just added some frozen berries on top. Yum! We are glad you enjoyed it, Jenifer! I’ve finally committed it to memory. This is my favorite snack! this is so delicious, I’ve already made it twice. I followed directions exactly and it came out perfect. The second time I used honey for sweetener and it was delicious as well. I didn’t blend it, I liked the consistency and don’t feel like it needs to be blended. Perfect as a dessert or just a little snack! I have now made this pudding literally hundreds of times and it seems to be a foolproof recipe. My favorite variant is this exact recipe with the addition of one small banana that have been mashed and 4 tablespoons of peanut butter. I made it with orange juice instead of soy milk and I have added mashed raspberries to the chocolate. I have made orange, pineapple coconut. All variants have tasted great and they always set up using 1/3 chia seeds and 1.5 cups of liquid. Thanks for sharing your recipe changes, Tom! We are glad you enjoyed it! Tasty. I layered with coconut yogurt and fresh berries for a breakfast parfait. This was a hit with my friends. I substituted maple syrup with honey (because I didn’t have maple syrup). So simple and so delicious. Thanks for sharing the recipe. Smart! Thanks for sharing, HD! I made this without blending. Instead I put one of the wire blender balls that come with protein powder in a sealed container with all ingredients then shook it up for a few minutes. It was perfectly blended, no separation, the next morning. Used about 2 tsp of Stevia instead of the maple syrup to sweeten. Smart! Thanks for sharing, Brandi! Where in the recipe does it say to blend it ? Mine came out liquid on top and thick slimey chia on bottom and I wonder if I blended it, that wouldn’t have happened. I just don’t see where I was supposed to? Thanks so much in advance ! Hi I blended it first-oops. It went very thick and pudding like. Didn’t taste it as I thought it meant sweeten in the morning by drizzling the syrup on?? I’ve put it in the fridge, will it be edible?? Is there a reason you should blend after refrigeration? You can blend it before or after, Ami! If blending, you can sweeten later with maple syrup or dates. This is a great recipe. I loved it so much I had it for breakfast and lunch, and when I gave it to my two-year-old for breakfast, he told me it was chocolate ice cream- SUCCESS! I’m planning on layering it as a dessert parfait with coconut whipped cream, fresh berries, and shaved chocolate for my vegan friends. Great recipe, Dana! Is it better to NOT blend the chia seeds? Guess I could just try it and see for myself. I want to avoid a bitter taste if possible. Both ways work, but we prefer unblended! I have been wanting to make a chia seed pudding, but honestly weary of the crunchy texture of chia seeds. I will have to say this recipe is delicious! I used coconut milk, 3 tablespoons of maple syrup and dark chocolate cocoa. Chocolately goodness!! I blended it tonight to convince my daughter she would like it. It still has some crunch because I only have a Ninja to blend it with, but she thought it was good. I am definitely making this again!! Thanks. We are glad you and your daughter enjoyed it, Sandy! Oh ma god sooooooo gooooooood. I just ate the whole thing. I meant to make it for my 8 month old. My bad ? This pudding recipe is HEAVENLY!! I too divide it in half and top with strawberries and banana for a decadent breakfast. I also use 4 dates, the blender method and a good dash of cinnamon. HIGHLY RECOMMEND! Yum! That sounds delicious, Megan! Glad you enjoyed it! 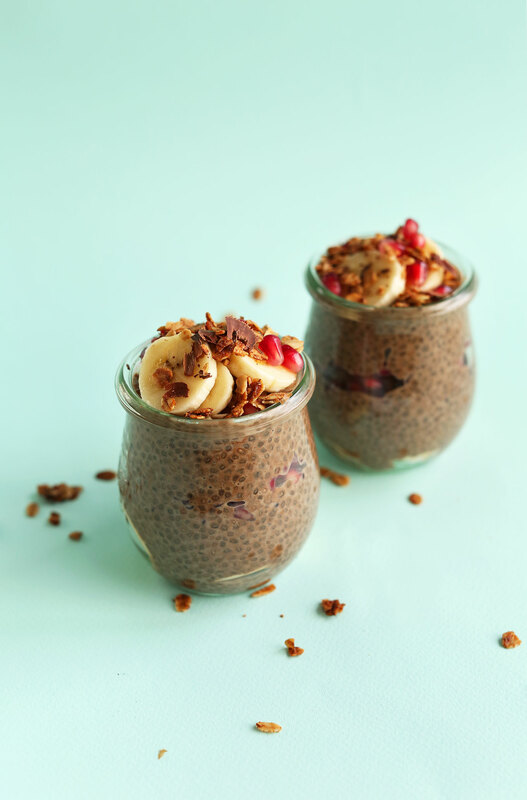 Firstly, this is hands down, the best chia pudding recipe ever! Thank you for sharing it. I used non fat milk, 6 dates and followed the recipe to a “T”. I whorled mine up in a Ninja blender. I divided the chia pudding into two jars (my husband has a hearty appetite). The pudding already had a thick consistency as I spooned it into the jars. I sampled it, and the pudding is to die for! It is almost decident. It was a rich, chocolaty, smooth spoon of pure heaven. I’ll be trying this with strawberries next. The possibilities are endless! For those who had trouble with the recipe, the only thing I can say is I measured everything. I used Fairlife nonfat milk (dairy). I used my liquid measuring cups for the milk, and my dry measuring cups for the dry ingredients. I did add 6 dates, a half a tsp of cinnamon, a half a tsp of vanilla flavoring and a dash of salt. I am so happy I found this recipe on the Internet. I’m truly sorry for the people it did not work for. Maybe experimenting with adding more seeds or less liquid? I hope every one of you have a blessed day. Thanks so much for the review and recommendations, Lila! We are glad you enjoyed it! How long is this good in the fridge? Hi! Leftovers keep covered in the fridge for 2-3 days, though it is best when fresh. It’s good for a couple of days as long as you have it tightly covered. I just made this and it is in the fridge. I am looking forward to tasting it BUT I have to say that it seemed like a lot of cocoa powder. It came out very dark, almost black and very thick – I had to scrape I out of the blender. Still looking forward to trying it soon! I left out the salt, reduces maple syrup to 1tbsp and added a half cup of mashed strawberries! Delicious! Thanks for sharing your changes, D! What a treat! I left out the salt and added a heaping tsp. of instant coffee along with the vanilla and cinnamon I sweetened with honey. I ate a serving with sliced almonds and another with tart cherries. This is something that I think I will keep on hand for a quick, sweet breakfast. Oh-so-chocolatey, and nothing to feel bad about! I did the blended version, AND added in a smidge of natural maple syrup and an touch of vanilla. No dates on hand. I could eat this for snacks, dessert, breakfast… plain or add some banana, strawberry or raspberry!! Can’t go wrong!!! I wonder if it is worth using the good Dutch process cocoa powder for this? Since it’s raw, maybe so. But then again, maybe not…..Any thoughts? thanks. How many oz are in a serving? I just made this. It is really good! I didn’t use syrup, dates, or anything extra to make it sweeter. Rather than using unsweetened almond milk I used chocolate almond milk. It sweetens it up without all the extra carbs! Hello, I made this chocolate chia seed pudding and kept it overnight unblended and it wasn’t thick like pudding more runnier and your chia seeds look more bigger just wondering what went wrong. I followed it exactly and used maple syrup for the sweetner. Hi Rema! Next time, add more chia seeds and give it a stir and that should help! I love this recipe!! I did it the blended way. I Put some wolfberries in the bottom a parfait glass and topped it with the pudding. My sweeteners were Yacon, maple and dates. I would definitely make again. Thank you!! I purchased ground chia seeds. Is it possible to use that in this recipe? I was wondering what the conversion would be for ground chia seeds instead of whole. That should work, but it does affect the texture. We still prefer whole! Check the comments from other readers for tips. Love the consistency! I didn’t blend mine, and I used 1/4 c. unsweetened cocoa powder and 2 Tbsp maple syrup. It was a tad bitter so next time I make I think I’ll go a little lighter on the cocoa powder and maybe a touch more of maple syrup. Tasted great otherwise though! I didn’t have the salt problem like most others did, but I just did a few turns of my salt grinder and didn’t measure so maybe that’s why. This recipe is amazing. Also, it freezes really well. I make up pots, pop them in the freezer then just get one out the night before to take to work the next day. Have made with coconut milk too, and also added orange essence at other times. I make up a whole batch using 1litre of milk, just multiply the quantities. I leave it in the fridge over night to ‘set’ then freeze it the next day. Thanks for the recipe! Mine doesn’t seem to be setting up…I used Stevia for sweetener and left unblended. Is it bc I keep my seeds in the freezer? I made this and loved it! I wouldn’t make any changes. Served with So Delicious Coco Whip. Next time, will sprinkle some mini vegan chocolate chips on top. Made this recipe today for my son. He is type 1 diabetic. If you could give me the accurate nutritional information, it would be great! Oh my, this was absolutely delicious. I accidentally left out the salt and after reading the reviews I’m glad I did. I will definitely be making this again and again. I made the unblended recipe using all ingredients except salt. I left it in the refrigerator overnight. When I checked in the morning there was a layer of the chia pudding on top of a lot of chocolate liquid. I stirred it and it was the consistency of a very thin cream soup. I’ve added 1/4 cup of chia seeds and hope that it thickens like pudding by the end of the day. Did anyone else have this happen? After adding the additional seeds, it instantly thickened. Needs a bit more chocolate and sweetener to be like the original flavor. I notice that neither the initial or additional seeds plumped up like the photo for this recipe. I used black chia seeds. Any tips on how to make the seeds plump up? I used black chia seeds and they did not plump up into a pudding consistency over night should i have used white chia seeds or what did i do wrong here? Hi Bre! Did you use the amount of chia the recipe called for? You may need to add more next time! I love this recipe! Do you think I could freeze the pudding and thaw it to eat at a later time? You have no idea how much this recipe has changed my life! I make this once a week and have yet to get tired of it. Thank you so much for sharing! Not good. I had to double the amount of dates and add vanilla to give it any taste other than salt. Much too salty. This was my first time making/trying chia seed pudding. I’m glad I chose this recipe! I did not blend and let it sit overnight. In the morning, it still seemed like there was a bit too much liquid. But I scooped some out to take for work, added sliced bananas, frozen raspberries, and coco whip. By lunchtime it was perfect! It’s the first time I’ve had chocolate pudding since going plant-based! Thank you!! I love chia seeds but always bought ready made products. I saw this recipe and had to have a go. I halved the recipe, didn’t add salt and exchanged the cinnamon for ground ginger. I used 1tsp raw honey for sweetness. I chucked everything in a plastic tub, put the lid on tightly and shook it to mix. I popped it in the fridge so its ready to go. Delicious. Another great recipe, Dana! My first try at chia pudding ever, and it totally worked (I tried the unblended version). I used regular milk (1.5 %) and 3 tbsp of agave, omitted the cinnamon, added the optional vanilla, and used just a pinch of salt instead of 1/4 tsp (I always do that, to me, 1/4 tsp seems to much for all recipes). I also did what was recommend in one of the comments and left the mixture settle at room temperature after the first round of whisking for about 15 min, then whisked again before filling the pudding into glasses and putting it into the fridge. Left it in the fridge to cool overnight and just had the most decadent Monday morning breakfast in a long time (your cinnamon rolls, which I’ve made a million times with a variety of fillings, will be for lunch – is it too obvious that this is the first day of my christmas vacation??). Will experiment with other flavors soon! Thanks again and happy holidays :). Hi Dana, I had recently bought chia seeds and was looking for recipes. So glad I came across yours. I had all the ingredients in the house so I made a batch using 2 tbs maple syrup and 1/4 tsp vanilla late last night. It was so easy! No blender, just used a whisk! I just had a taste this morning. It was absolutely delicious. Thank you so much for sharing your innovative and creative ways with food! Now I have a dessert that is good for me. I absolutely love this recipe! I use it as a sweet treat while doing Whole 30 diet. Just use dates as the sweetener. Also, I do a mix of half almond milk half coconut milk to give it a creamier taste. Looks delicious! Could I try half brewed coffee and half milk? Hi Elizabeth! Sounds yummy! We haven’t tried it but that should work! Let us know how it turns out if you give it a go! How much vanilla extract would you use instead of the cocoa and how much honey instead of the dates? Could you provide measurements to make 2 servings rather than 4 please? Thank you! I made this with regular cow milk and it seems like the cocoa powder is settling on top of the seeds and not letting them expand. They got a little bigger but doesn’t be look anything like the picture. Is it because I used regular milk? For an extra special version of this treat try melting dark (vegan chocolate) adding a touch of soya cream and then folding it into the chia pudding (made the day before). Great for special occasions. I added the grated skin of an orange to make a chocolate orange pudding. It was amazing…..
I’d love to try this but need to cut out the maple syrup/honey/agave due to diabetes concerns. I have Stevia (liquid and powder) on hand and will attempt to use that instead. Just way to much sugar for me. Has anyone else altered a recipe in such a way? Did the exact recipe and finding the texture to be too liquidy. This recipe is lovely! I’ve made it a couple times now with my daughter using all the exact measurements and it came out perfectly! I used almond the first time and made two variations, chocolate and vanilla. The second time I used Organic Coconut Milk, from the can, and it was leaps and bounds better than the almond milk. I used Organic maple syrup to sweeten and top with ground flax seeds, hemp seeds, and strawberries and eat for breakfast! I don’t know why anyone would think it salty because the ratios are spot on! Love this! I shared it with a colleague and she loved it and I just printed off the recipe for her as well. This has become my favorite thing to make when I’m craving chocolate. I actually like to blend all the non-chia ingredients first, THEN add the chia seeds. The dates blend up well, and then I get to keep the chia seeds whole to avoid that husk-y taste. wait, i made this with homemade cashew milk instead of almond and holy sh*t it came out so good. it was like chocolate rice pudding. so good, i’m making it tonight. I love this recipe. I especially love the real maple syrup for a sweetener. This is solo good! I made this, unblended. Holy mother it is so good!!!! I used the leftovers from a can of coconut milk (mostly water and a little cream). I topped with blueberries and didn’t share with anyone else. Next time I’ll try blending it but it was great this way too. Hello! Thank you for this recipe. I’m wondering if you can process small jar of this chia pudding in a warm water bath and have it preserved for some time? Any experience with that?? Thanks again. I love all your recipes! Hi! We haven’t tried that so we can’t say, but if you do, report back on how it goes! So I made this w regular milk because it was all I had in the house (but I had read this shouldn’t affect the outcome). Lol I went wrong somewhere I left it overnight in fridge- the flavor is nice but the chia seeds still have a crunch – nobody would describe this as creamy– do I wait few more hours? Hi! Try blending it, or waiting a few more hours! What is the serving size? I know it yields 4 servings but what measurement is the serving? 1/2 cup? 1/4 cup for a serving! I’ve made this pudding twice so far. First time i used rough amounts of all ingredients (tablespoonfuls and teaspoonfuls), as in the recipe, and it came out smashing. The second time, last night, i decided to take out my kitchen scales and follow the exact amounts in grams. And guess what? It wasn’t as great anymore. Too much seeds and too much cocoa, as the result was a very thick blob of chia, with very powdery texture of cocoa. Shame. Next time I’m gonna have to get back to rough estimates ?. Overall a good recipe. Thanks​. I’m going to try this- but thinking of adding peppermint extract. Would this go well? How much to add? Hmm I’m not sure how it would taste! If you try it, start out with a small amount (1/4 tsp) and adjust to taste! I thought it was bland. I used good Dutch cocoa, and good bit of vanilla bean, maple syrup and dates. If not blending, you need to crush or grind the chia seeds first. Otherwise, you won’t be able to absorb the protein and other nutrients as chia seeds swallowed whole cannot be digested well by humans. You still get the benefits of soluble fibre, but if you count on the protein too, you must grind the seeds first. Turns out we only had dark chocolate cocoa …and topped with raspberries it was great! So refreshing to make a recipe that I actually liked! (Ha!) I did cut the salt in half, just in case, and with the dark chocolate I believe it was a good call. Cheers for a good recipe! I tried a few recipes and this has been consistently the best. Mine has always thickened up within hours. Flavor is excellent with the cinnamon. I had forgotten I ran out of maple syrup so I used some honey instead. I just made this and it was tasty, it set up way thicker than I expected. A half recipe fit perfectly in a half-pint mason jar. I started with the cocoa and a tablespoon of the milk, and mixed it to a paste with a tiny whisk I got on amazon. I just put a shake of salt in due to the previous comments. This is VERY good. I must be both gluten and dairy free, so pudding has been a thing of the past for me–until NOW. I did the non-blended version. Having read several comments that talked about it separating, I decided to use my little whisk attachment on my immersion blender to mix it up. I had NO problems with separation–not that it lasted long enough for the ingredients to part company with one another. I tried the first ramekin shortly after mixing it up to see if it was worth waiting for. Yumm. I waited about two hours and had the second ramekin with dinner as it had already set quite sufficiently. BIGGER Yummmm. And the third ramekin went across the street to my neighbors who rarely think about dinner until they are ravished with the rest of my dinner leftovers. I heard sighs of YUMMMM from all the way across the street. Thank you for the recipe and for your wonderful blog! Just made this with oat milk and cocoa powder here in the UK. Result: delicious! I made a similar recipe last night and concluded this had possibilities. I would like to make this version. However the only thing I did not like about my chia pudding is that the chia seeds settled at the bottom of the jar, so the top layers had less chia seeds and a nice creamy texture, with the slight chewiness characteristic of chia seeds. But as I ate through that layer, the bottom one was almost solid and the texture was no longer pleasant. How do you prevent the chia seeds from settling at the bottom and have them more evenly dispersed through the pudding. Hi Martine, Chia pudding seems to do that! I would recommend giving it a couple stirs to prevent this. I’m a new vegan and this was my first time using chia and making s vegan pudding. Oh my word!! So good. Thank you! I don’t like dates so I used 1 banana instead and it tasted great! Very easy to make and delicious! This was delicious! I do have a question, though — I whisked mine and let it sit overnight. The next afternoon when I scraped out the bowl, there was a layer of chia seeds stuck to the bottom of the bowl and they didn’t seem plumped at all. I put it through the food processor (our blender isn’t great) and it’s still very seedy and kind of a weird thin consistency. Gloopy yogurt that separates is probably the best comparison I have. I followed the recipe and used maple syrup as my sweetener. Any suggestions? Most whisking? Or shake it up after it’s been in the fridge for a bit? Thanks! Hi Emily! A quick mix after it has been in in the refrigerator should fix that! The pudding looked very good and like the right consistency when I pulled it out of the fridge. However, when I added in honey, it turned into a liquid and became a slightly darker color than before. It tastes pretty good, besides the fact that it isn’t really “pudding” anymore. Has this happened to anyone, and if so, do you know how to prevent it? The salt ruins this recipe!!! Start with using just a pinch and then add to taste. Regardless 1/4 tsp is wayyyyyy too much. This was so easy and delicious. A new staple for my afternoon snack. I blended the almond milk and dates before mixing and it came together very well. I find that this did not work at all when you puree the ingredients together in the big vita mixer. I think that the Chia seeds cannot be ground up to grow fat and plump. I suggest puree-ing all the other ingredients and then just hand mixing in the Chia Seeds and then letting it set. Can you use PB2 (Peanut Butter Chocolate) Powder instead of the Cacao or Cocoa Powder? Hi Katy! I haven’t tried it, but I think that would work! Report back if you try it! This was delicious! We served this as the ‘dessert’ at a brunch we hosted for friends. To let it set, we divided the pudding into individual servings (we used mugs). We topped this with coconut whipped cream. I’ve been trying to be gluten free and dairy free. This morning i was stumped as to what to have for breakfast. Saw Almond Chia pudding on a facebook post and googled a recipe. I LOOOVE it. I heated the milk and had it warm with frozen raspberries and almonds on top. It ticks so many boxes – high protein, omega 3 fat, low gi, low carb (I had 4 dates), gluten free, dairy free. Thank you! This will be a regular at my house. Very tasty! I love it and at least one of my kids likes it (I think if I cut the cinnamon the other one will like it too). It’s great to get something healthy and filling into us before school. Thanks for the recipe! I love this recipe so much! I make it all the time. Thank you so much for sharing ? Wow I’m so obsessed! Would never guess this is vegan. I used almondmilk and it turned out great! about 110 degrees. Came out very thick just like pudding should be. Taste is excellent. I didn’t blend it. I don’t mind the crunch. I also left out the salt. I just made this today finally, its tastes good!! Candida Diet Version – Chia seeds, use coconut milk (full fat, coconut is awesome vs. Candida), use vanilla creme Stevia, and Hershey’s special Dark Cocoa. Yes, it works. Yes, no salt. Yes, delicious. Do – overnight the chia in fridge. Oh yes! Thanks for the springboard!!! I made this yesterday alongside some vegan fried rice, and I loved it! I am the only vegan in my family and I live in the Middle East, so it is really difficult for me to find all the ingredients to make most recipes. This recipe, however, was so easy to make, and I would recommend it to anyone who wants a healthy and good tasting breakfast or snack. Can I use ground chia seeds for this? My Walmart only carried ground chia seeds and I’m trying to find a use for them. That should work, but it does affect the texture. I still prefer whole! My favorite pudding is tapioca, and I love chia seeds because they’re like tapioca with a bit of a center. So, I’ve been toying around with chia pudding for a while. 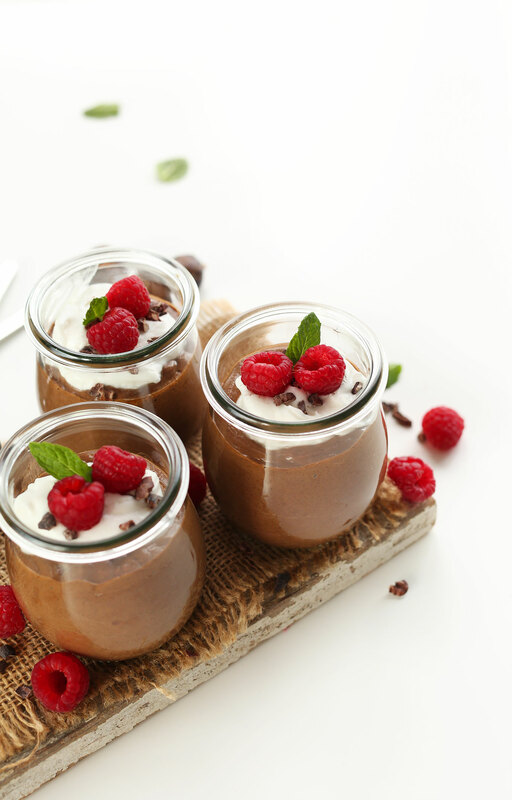 This recipe caught my eye, chocolate pudding for breakfast? And it’s healthy? Count me in! I just whipped up a batch, and it tastes sooo good right now I know it’s going to be a hit come morning. I don’t blend chia seeds, but people, make your life easy. Buy a couple of those canning jars (Ball, Mason, whatever) and make your pudding and smoothies in those. Mix them up the night before, and instead of dirtying a blender, put the lids on and give them a good shake. Add frozen fruit, and stick them in the fridge overnight so the fruit thaws. Next morning, if you want to blend things, use a stick blender, which fits right into the jar and is super easy to clean. Most places that sell canning jars sell cool tops to go with them, my fav is the ‘adult sippy cup’ top, toss in a straw and instant travel mug to enjoy things while you commute to work. The more I make this recipe the more I love it! I added a banana to offset the bitterness of the chocolate. It worked perfectly. I also pureed mine. I prefer puree because it makes it easier to eat quickly. Very good. I will have to make it again. Love it!!! I blended everything and my husband and I enjoyed it so much. Thank you so much for sharing this recipe. I have made this recipe twice now, and both times I absolutely loved it! The first time I made it using coconut milk and the end result came out a bit thicker and sweeter which was perfect for pudding. The second time I used almond milk and it was much thinner, however, still tasty. I also added blueberries and sliced bananas which put this recipe over the edge! The blueberries and chocolate really compliment each other and keep you feeling fuller longer. Even my husband liked this one and he is not one for healthier options. Highly recommend this and do yourself a favor and double the recipe because you will want more! 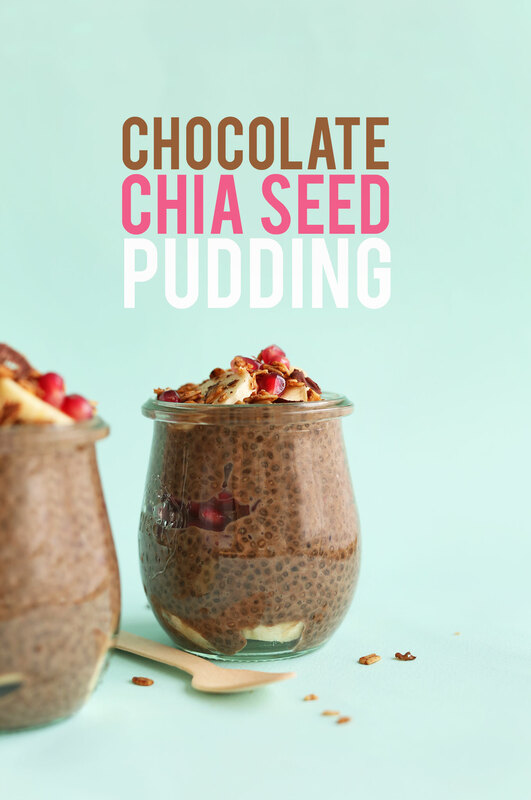 This is the first recipe I have tried with chia seeds and it was delicious. I’ve been eating the pudding for breakfast with chopped roasted almonds on top. I followed the feedback about the salt and only used a pinch for mine and it was just right. Rich and chocolatey. I made this and went to check it this morning and it looks exactly the same as it did last night, the chia seeds didn’t expand at all. Where did I go wrong? How well does this freeze, or can it be frozen at all? This looks delicious btw! Hi! Though I haven’t tried freezing it, a little searching has led me to believe that it is indeed freezable! Just thaw in the fridge prior to eating and you’re good to go! I’m really late to the chia party, and this was my first time to try chia pudding, but the result was good! For those of you who haven’t tried chia pudding and are wondering if you should believe the “it’s gross” or “it’s delicious” feedback above, think tapioca pudding with a very, very slight crunch. I followed the recipe and used 2.5 T of maple syrup and didn’t blend based on Dana’s preference. I added sliced bananas, salted cashews, and a drizzle of maple syrup on top–yum! The crunchiness of the nuts made the slight crunch of the chia not off-putting. For those of you who aren’t vegan, I used lactose-free skim milk (cow’s milk) with no problem, but let the seeds sit in the milk on the counter to gel before mixing everything else in and putting it in the fridge. I am looking forward to this for breakfast again tomorrow! Thank you, Dana! My vegetarian husband and I (not a vegetarian) love your recipes and blog! Like the sound of this recipe, I have a quicker way to do it though… Ive been milling my chia seeds into a powder in the Thermomix and using it as a binding agent, sprinkle with lsa on porridge and add it to my protein shakes to keep me fuller. I found using the chia powder sets the pudding quicker in the fridge but Ive only been using Vanilla… cant wait to try the powder in this Choccy version! So if I decide to blend it just pour in bowl and refrigerator overnight then sweetener? Or do I add sweetener after blending? If I were to blend this as you mentioned, do you think it would be the same consistency as pudding to put in chocolate pudding pie? Was considering trying it with a coconut whipped cream topping! What causes the “Pudding” to separate? All chia seeds went to the bottom and gelled so e. Liquid on top.? So weird! Did you use homemade almond milk? Sometimes it separates. Otherwise, perhaps your chia seeds were old? My seeds were fresh and I used store bought almond breeze almond milk. What does keep the seeds from just floating down to the bottom? Hi! I made this a few days ago and it turned out super bitter. Something I dont think honey will fix. Has this happened to anyone else? Suggestions? I searched the Internet for chia seed recipe since I have a bag of Chia that I got from Costco. I chose to try your recipe due to the reviews. I read most of the comments below and decided that I will stick with the recipe except I used coconut milk beverage. I made it last night and just had it for breakfast this morning. I added frozen blueberries and two dollops of cool whip. SO DELICIOUS! Ahhh!!! I’m SO super late to chia seeds but finally I’ve gotten around to it! Would I be able to add maca powder + instant coffee granules to the chia pudding mixture? I’m slowly trying to incorporate more plant based alternatives to my lifestyle, and your recipes are super easy and helpful to me :) oh btw do you have a recipe for homemade oat milk? I dislike nuts and soy so my options are limited, I’ve tried rice milk but I found the taste was very bland. Thank you! Is it suitable for only one persons breakfast? And also is it dangerous to have this amount of chia seeds in only one sitting? Hi! You could always cut the recipe in half as this serves 4! And no, not dangerous at all! Good luck! Made this recipe a couple times, and love it! Instead of mixing in a bowl I place all the ingredients in a Mason Jar and shake it vigorously until blended well. Works like magic and no bowl to clean!!! I made this using ground chia seeds and I used a trick I have used in the past with flourless cookies. It worked (for me at least) to help the pudding thicken. Place the ingredients for the non-blended pudding in a covered bowl or container. Shake vigorously for 15-20 seconds before putting (uncovered) in the fridge until thickened. In less than two hours, my pudding was thick enough to eat (I couldn’t wait any longer to try it.) The amount of chia seeds I used probably worked out to slightly more than the amount stated in the recipe since I used the ground chia. I found it delicious as is, without additional blending or sweetener. Thanks Dana! I’ve tried some commercially made chia pudding in the past and was not impressed. So I was a bit skeptical of this recipe. I’ve been trying to incorporate more chia in my diet, because it’s a good source of iron and fibre. I decided to give this recipe a try and I’m so happy I did! I used vanilla hemp milk, Ghiradelli-brand cocoa powder and five dates blended in a vitamix. I left the chia seeds intact for the overnight soak. My daughters (4 & 6) LOVED it and couldn’t believe they got to have pudding with their breakfast! My husband wasn’t a huge fan of the earthy flavor of the seeds, so in my next batch I think I’ll try to soak my chia then blend them in after they’ve gelled. The base of the pudding (without the chia) is unbelievably rich and tasty. I’m not a vegan and to me and my kids- it tasted like brownie batter. I’m really impressed! Thank you for sharing this recipe. I made this pudding, and it’s delicious! One thing I varied was to use 1 c almond milk and 1/2 c canned coconut milk instead of 1 1/2 c almond. I also used about 1/4 teaspoon of honey rather than 1/2. If I were to change it for next time, I’d probably use less (or no) cinnamon, more honey, and much less cacao. I’m definitely a chocolate person, but the amount of cacao made this a bit bitter for me! This could have to do with my mixing method, which was to add all the ingredients into a jar, and shake them all up! This recipe filled up a 12oz jar, so in the future I might use a larger jar for more mixing room. I shake for about 15 seconds, let sit for 10 minutes, then shake again for another 15 seconds before putting it in the fridge overnight. It was so thick and creamy in the morning! Update: I just took my unblended version, added dates and a bit more almond milk, popped it in the blender, and voila! There’s that creamy dreamy perfect pudding recipe. I must say, with this particular recipe, I prefer the blended. Thanks, Minimalist Baker! AWESOME RECIPE! After getting the base ingredients, I got a little creative and added some coconut flakes I had on hand, and after tasting the unchilled version was a bit too chocolate for me, i added More milk & chia, and balanced it out with some dark chocolate whey protein powder I had on hand. The result was DELIGHTFUL! And such a great protein start to the morning! One can only eat so many eggs for breakfast before it starts to get old lol an chocoholic sister loves the base recipe! I made this last night after searching high and low for a good chia seed pudding recipe and finally I’m converted! I’ve tried unblended a few times in different recipes and they haven’t quite made it for me. I tried this recipe blended and Oh em geee!!! It was amaaaazing! It tastes toooo good! I might give the unblended another go but so far soo good! Well what a surprise! Really, really good. I cook …a lot ( went to cordon bleu) This recipe surprised me. I used Ripple Pea Milk… (I’ve tried them all – best plant milk – really, try it) then valrhona cocoa and organic maple syrup and salt level was fine..simply stirred…put in fridge and voila…really? really! …really good! I can’t believe it. Thanks! Excellent recipe. It takes less an a min. to assemble- a night in fridge. I’m going to make for my friends and blow them away. Chia …who knew? First time using chia seeds. Pretty cool! This recipe was just ok to me. I think I might enjoy something fruity mixed in and not necessarily chocolate, but it wasn’t bad at all. I used agave to sweeten it and it worked great. Actually, the pudding tastes exactly like chocolate twizzlers. Hi, I just found this one. I replaced the maple syrup with raw cane sugar (Rapadura) and it’s just…. exellent!!! I tried this recipe as I am trying to watch calories and lose weight. I have used chia seeds on my cereal but never thought you could make a pudding. Anyway, I used skim milk instead of almond milk and substituted honey for maple syrup, as I didn’t have any in the house. I used 2 tbsps. honey. I was disappointed with the results. It didn’t thicken as much as a pudding and it could have been sweeter (maybe I didn’t add enough honey). I wonder if the substitutions affected the recipe. I would like to try it again. I was so excited to find this recipe and so I made this last night and left sitting in the fridge overnight as the directions called for. This morning I am disappointed to find this still as a liquid in my fridge. I feel like I just wasted a ton of expensive ingredients! :( I modified it a bit to leave out the chocolate but included the rest of the ingredients. Real bummer. I’d like to make your chocolate chia seed pudding but have a food sensitivity to almonds. What can I use in place of almond milk? Try self-made coconut milk or hazelnut milk? Love the cute little cups you serve this in! Where did you get them? Hi! Aren’t they super cute? I got them here. I was so excited to make this recipe for my vegan and health-conscious family!….. they hated it. If you like 85% dark chocolate you’ll love it, but for me, having a whole cup full of it is not enjoyable. I would advise you gradually add the cocoa powder instead of all at once adding the 1/4 a cup into your mixture. Could you use coconut milk instead of almond milk with this? I accidentally blended before letting it sit overnight;(….. does the end result taste bad? I’m wondering if I should redo — I wanted to make this for my fiancées birthday dinner. Mine wouldn’t set, why? It set on too and was liquid on the bottom ..
Hmm, were your chia seeds fresh? Try adding more next time! 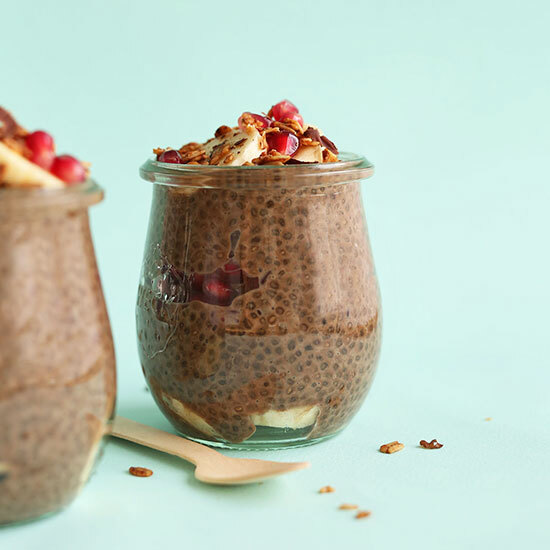 I have tried many chia pudding recipes, but this one is my all time favorite. I prefer using a whisk to mix it up. I top it with fresh fruit and granola and it is a delicious breakfast. Thank you! Do you think chocolate almond milk would work? Or would you still add cocoa? I’d still add cocoa! Good luck! Looks like a great dessert! Can you use raw milk instead of coconut milk? Hmm, I would think so! That could work! Wow, this is… chocolatey. I bought cocoa powder at the Amish store and I’m sure is stronger than the big commercial brands. I’m sure my kids will love the pudding, but it’s a bit much for me! I actually use less cocoa than the recipe calls for. The dark chocolate can be overwhelming. I’m new to almond milk so this might be a dumb question- apologies in advance. If you used sweetened almond milk and omitted the dates/maple syrup etc, would this still work or would the sugar content blow right out? Hi! I would recommend slightly reducing the sweeteners if using sweetened almond milk, but not omitting. Good luck! Hmm, perhaps add more chia seeds next time? Sometimes different brands or even the freshness of the chia seed can affect this. Same here. It was like very thick chocolate milk. I just added more chia seeds and am waiting to see if that helps it. I am on a no sugar (even fruit) Candida diet. Do u think I could replace dates with Stevia? This is great!! Like a healthy dessert. I actually got the recipe from a ‘winter detox’ diet from yummy mummy but I didn’t realise it was your recipe til it came up in a google search. Do your ingredients ever separate while in the fridge? Not good. We love chia pudding, but this had such a fake off taste with the dates for sweetener. I used excellent cocoa powder and dates, but had to throw it all out. No one liked it, sadly. Chia pudding – I only found the chia powder, will it still work for this recipe. Do I use more or less? Hi Maria, I’m not so sure chia powder would work in this recipe because the seeds help with the consistency of the pudding! If you do try it, use less because the powder is finely ground chia seeds. We haven’t tried this with soy milk and can’t guarantee the results, but I think it should work! Good recipe. Im the only person in my family that liked it. Anything with chia seeds they bulk. Well by next day of eating it I needed new life to it. French toast. Just the pudding, stale breaf, more seasoning as in cinnamon and vanilla. Thats it. I never got to eat it. My family devoured it in a blink of eye. So that must be the key to this recipe!! :) thank you!! I love the glasses that you are serving your chia pudding in. May I ask where you got them or who makes them? Thanks! Hi Rosa! I get them at World Market and the brand is Weck. OMG!!! THIS IS DELICIOUS. I bought a bag of chia seeds awhile ago from Costco with the intent of cleaning up my eating habits. The bag sat around the house for awhile, me being clueless what to do with it. Then the other day, my son asked for a smoothie, so I threw some of the chia seeds in there. Not bad, I thought. Today I read how chia is chock full of healthy Omega -3 and I decided to make a chia pudding. I found your recipe. Other people had commented and left good reviews and the recipe was simple enough. I used coconut milk, dark chocolate cocoa powder (3 tbsp), a splash of vanilla, maple syrup and the chia. I whisked it all together, it thickened up right away and I tasted it – it was divine. In fact I can’t believe how much I like it. Next time I’ll add the cinnamon which I forgot and maybe the salt which I also forgot this time. I think I’m also going to try once to make it with stevia powder to see how that tastes. I can’t wait until tomorrow morning to see how it tastes after sitting in the fridge and thickening up some more. Thank you so very much for posting this recipe!!! I made this last night by halving the recipe in a single serving blender and used 4 pitted dates for sweetener. It thickened up right away and I tasted it with my finger…..not sweet at all, very bitter. THEN I put it in the fridge overnight and had some this morning. It was good! Still not super sweet, but not bitter. It was rich and satisfying like a good piece of really dark chocolate. I’m not sure if letting it sit made the change or if it was my altered expectations. But I will definitely make it again. Thanks for the healthy recipe. My Chia seed pack sayd don’t consume more than 15g chia seeds per day! Yum!! I made this last night and had it for breakfast this morning,layered with yogurt and blueberries. Sweetened with just a good dash of maple syrup, it was absolutely delicious! THIS IS SOOO DELICIOUS!!!!!! THNX FOR THE RECIPE! NOW, I MADE MINE W/ COCONUT & HEMPSEED MILK I MAKE AT HOME. I HARDLY EVER USE ALMOND. I think that would be awesome! Worth experimenting on for sure! Thanks for sharing, Leslie! Made this today and it’s still incredibly watery after 6 hours sitting. Also, even after blending, it didn’t come out smooth. Any suggestions?! Thank you! I can’t thank you enough for this recipe! I have made it using full-fat organic coconut milk, lite coconut milk and coconut almond milk, and each variety is amazing! I haven’t done blended, but I love it unblended, as do my husband and two girls (3 and 5). It reminds me so much of my all-time favorite dessert since Kindergarten: chocolate mousse! The bonus is that I always have the ingredients on hand. So yummy with toasted coconut or fresh raspberries on top! I am obsessed! Something nutritious that tastes so naughty! I’ve also made a similar recipe that uses two ripe bananas for the sweetener–also very good, but I prefer this recipe, using 2 TB of maple syrup. I WANT TO CONGRATULATE YOU FOR BEING AHEAD OF YOUR PEERS IN – HEALTHY LIFESTYLE AND INTERNET SAVVY!!! THAT’S GREAT! Made the unblended recipe today and followed it exactly, it’s been a few hours (almost 8 to be exact) and the mixture is still pretty runny. Any reason this happened or how to fix this? Some recipes say to leave it out at room temperature for about 20 minutes before refrigerating. I haven’t tried this version yet, but the vanilla pudding turned out thick and creamy. Just wondering, since the recipe is for 4 servings, how long can I keep them in the fridge before going bad? Wow I just made this and put it in the fridge for overnight and I CANNOT wait until tomorrow. It already tastes great! But I am wondering if I made a big mistake, I mixed everything right from the beginning, including the sweetener (3 T of honey). Have I made a big mistake? I sure hope not because it looks delicious! Thank you for this! I am absolutely in love with chocolate and wanted something that’s on the healthier side to get my fix. Thanks! I tried it because I had all the ingredients. The thing I liked the best is that the recipe is basic and gives room to make it our own. Personally, I thought it had too much cocoa and I would have made it sweeter. I used unsweetened original almond milk and a teaspoon of honey. Also, afyer 20 hours in the fridge, the chia seeds were half the size of the ones in the photos. I think it is important to let them absorb as much liquid as possible. I ate the whole thing in one sitting! Next time I will double the recipe to share. Thanks! I used chocolate cashew milk in place of almond milk and didn’t use much agave being that the milk was already pretty sweet. Turned out DELICIOUS. Thank you so much for posting this recipe! Sooooo yum!! Couldn’t stop eating it! I used raw honey and only 2 tablespoons and was definitely sweet enough. Thanks for such a great recipe. My new chocolate craving reliever I think ? I tried the unblended version and it was amazing!! Want to try the blended version now but am a bit confused. Should I be blending it before letting it sit or after?